Election Tracker LIVE: Replacing Union minister SS Ahluwalia, the Bharatiya Janata Party on Sunday evening fielded Raju Singh Bisht from Darjeeling. Earlier in the day, sources had told News18 that Ahluwalia had opted out from the seat, and was said to have expressed his wish to fight from any other constituency. Meanwhile, GJM spokesman and central committee member, Swaraj Thapa, resigned from the party in protest against GJM's support to "outsider" from Darjeeling seat. External affairs minister Sushma Swaraj today said the return of Indian Air Force pilot Abhinandan Varthaman from Pakistan in two days was a huge diplomatic win for India. Swaraj, while speaking at the BJP’s ‘Vijay Sankalp Sabha’ in Gautam Buddha Nagar, said India successfully thwarted the neighbour’s efforts by downing their aircraft when the two were engaged in an aerial combat post the air strikes on Balakot. SS Ahluwalia in a statement said, “I’m honoured to have served the Darjeeling Lok Sabha constituency as an MP in the 16th Lok Sabha. Now keeping the princliples and necessities of coalition dharma in mind and in the larger interest of the party, I have expressed my desire to recuse myself from candidature as a Darjeeling Lok Sabha candidate…” Earlier today, Ahluwalia informed the Bharatiya Janata Party leadership that he will not contest from the seat in the upcoming Lok Sabha polls. Later in the day, BJP General Secretary Kailash Vijayvargiya announced the name of Raju Singh Bisht from Darjeeling. GJM Spokesperson Resigns After Party's Support to BJP in Darjeeling | Gorkha Janmukti Morcha spokesperson Swaraj Thapa resigns from the party.Thapa in his resignation wrote, “I am tendering my resignation from all posts as well as the primary membership of the Gorkha Janmukti Morcha. I am doing so in strong protest against the idea of foisting a candidate for the Darjeeling Lok Sabha seat who is a rank outsider, has little political background and absolutely no knowledge or interest about the issues regarding Darjeeling, including its core issue of Gorkhaland." Ex-Union Minister Pratik Patil Breaks Ties with Cong | In another embarrassment for the Congress in Maharashtra in run-up to the Lok Sabha elections, former Union minister Pratik Patil announced that he was "breaking ties" with the party. Patil, the grandson of Congress strongman and late chief minister Vasantdada Patil, has not announced his future plans. His decision came days after the Sangli seat, which has been a traditional bastion of the Congress up to 2014, was allocated to the Swabhimani Shetkari Paksha of Raju Shetti as part of the seat-sharing deal between the Congress, the NCP and other constituents of the "United Progressive Mega Alliance". "In the current environment, I cannot stay with Congress. Some people are trying to end the legacy of late Vasantdada Patil," the former MoS for Coal said. 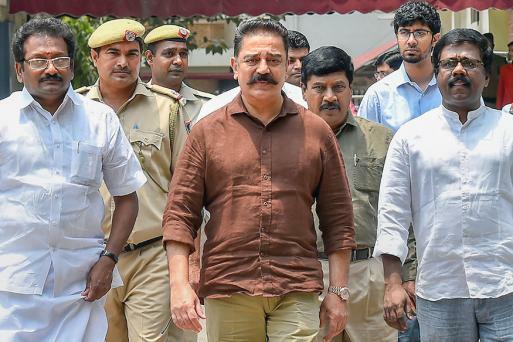 Haasan's decision comes days after he criticised Rajinikanth for not contesting in the upcoming parliamentary elections. 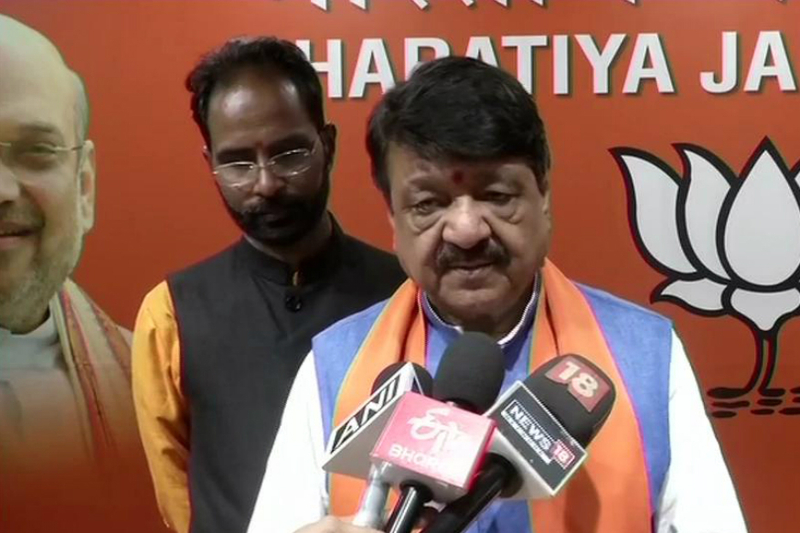 BJP General Secretary Kailash Vijayvargiya says, “Raju Singh Bisht to contest from Darjeeling Lok Sabha constituency in West Bengal. SS Ahluwalia in a letter to Amit Shah has expressed his inability to contest from Darjeeling. He has stated that he can contest from any other seat in West Bengal." Gorkha Janmukti Morcha and Gorkha National Liberation Front to support BJP in Darjeeling in upcoming Lok Sabha elections. Karnataka Deputy Chief Minister and Congress leader G Parameshwara on Tumkur parliamentary constituency: I request him (SP Muddahanumegowda) to obey the coalition dharma. JD(S) spokesperson Ramesh Babu had announced that they will be fielding HD Deve Gowda for Tumkur constituency. However, troubles mounted after Congress’s SP Muddahanumegowda said that he will be contesting from the Tumkur seat as an independent. 'Treatment meted out to Advani shameful' | Shatrughan Sinha, the sitting BJP MP from Patna Sahib who has been denied a ticket by the party this time, has accused PM Narendra Modi of treating party patriarch LK Advani in a "painful" and "shameful" manner. “Sirji... it is worrisome, painful and according to some even shameful... that which your people have done was the most expected and awaited... orchestrating the departure of a most respected friend, philosopher, guide, father figure and ultimate leader of the party, Shri LK Advani from the political arena/election," Sinha tweeted. “No one can approve of such a treatment to a father figure. What you and your people have done to me is still tolerable. I am able and capable of answering your people back in the same coin. Remember Newton's third law, every action has an equal and opposite reaction," Sinha said. Odisha CM Naveen Patnaik announces BJD candidates for 9 Assembly constituencies: Kishore Mohanty from Brajaraj Nagar, AN Singh-Bolangir, Pradeep Behera-Loisinga,Pitam Padhi-Pottangi, PK Dishari-Lanjigarh, PC Majhi-Jharigam, Mukunda Sodi-Malkangiri,Dr R Panigrahi-Sambalpur&Rohit Pujari-Rairakhol. 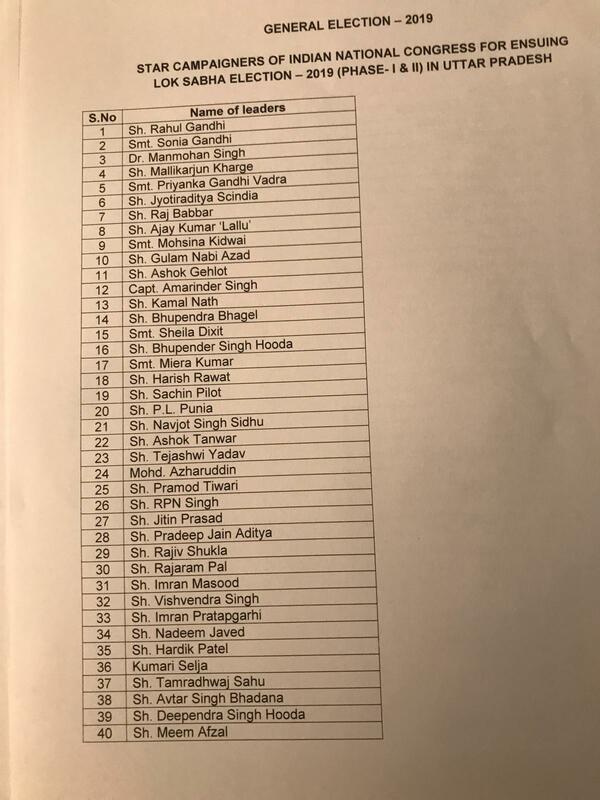 Congress released the list of star campaigners for the upcoming Lok Sabha elections. Former Odisha DGP Prakash Mishra joined BJP in the presence of Union Minister Dharmendra Pradhan, at party headquarter in Bhubaneswar. “I firmly believe the strength of the party and the alliance will help me win the Sivaganga seat. This is the second time I am contesting elections,” news agency ANI quoted Karti Chidambaram as saying. He will be contesting Lok Sabha elections from Sivaganga in Tamil Nadu. Oppn grand alliance has reached 'expiry date' even before its manufacturing: Naqvi | Taking a swipe at the opposition grand alliance, senior BJP leader Mukhtar Abbas Naqvi said the "so-called mahagathbandhan is an adulterated product" which has reached its expiry date even before its manufacturing. Addressing the Vijay Sankalp Sabha in Rampur, Naqvi said the country doesn't need a "Mahamilawati (super adulterated) government", and instead wants a tested and decisive government that can move forward towards commitment to aNew India. People of the country will again bring a stable government committed to good governance under the leadership of Prime Minister Narendra Modi in the 2019 Lok Sabha elections, the union minister was quoted as saying in a statement from his office. Samajwadi Party releases its list of star campaigners for the second phase of elections. BJP releases a list of nine candidates for the upcoming Lok Sabha elections. Sunil Soni will contest from Raipur (Chhattisgarh), Rikman G Momim to contest from Tura (Meghalaya) and Raghunanadan Rao from Medak in Telangana. Congress released the ninth list of 10 candidates for the upcoming Lok Sabha elections. Karti Chidambaram will be contesting from Shivaganga (Tamil Nadu), BK Hariprasad to contest from Bangalore South and Tariq Anwar to contest from Bihar's Katihar. BJP president Amit Shah launched the party's poll campaign "Vijay Sankalp" with a rally in Agra, Uttar Pradesh. 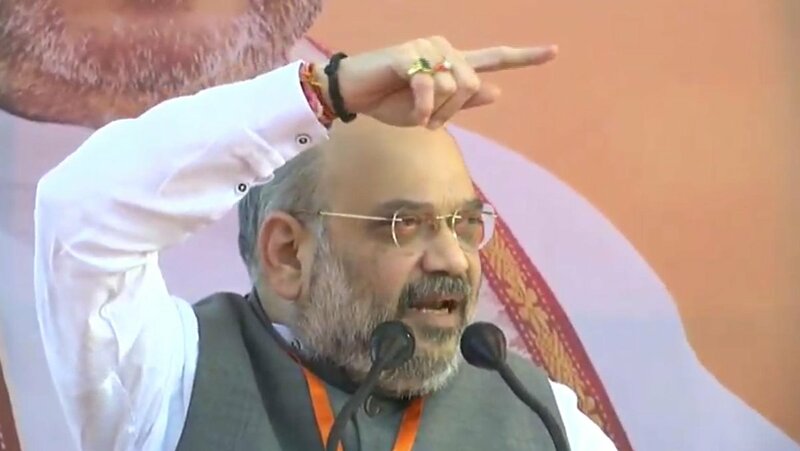 Addressing the rally Shah said, "Why should we elect a PM, just because someone son's age is now of becoming PM or to elect a PM who can do development and who can give a befitting reply to Pakistan." BJD will play a major role in govt formation at Centre: Naveen Patnaik | Chief Minister Naveen Patnaik today claimed that the BJD will win all the 21 Lok Sabha seats in Odisha and play a major role in government formation at the Centre in the coming elections in which no national party will be able to get a majority. "No national party will be able to win a majority in Lok Sabha election this time. BJD will have a decisive role to play in the formation of the next government at the Centre," the Biju Janata Dal president said while formally kick-starting his party's poll campaign at a rally in Nayagarh. Claiming that the BJD will win all the 21 Lok Sabha seats in Odisha, Patnaik said this will give an opportunity for putting an end to the "historical injustice" meted out to the state. Picture of Congress Membership Form with Sapna Chaudhary's name and signature on it and fee receipt from yesterday. Singer and dancer from Haryana Sapna Chaudhary joined the Congress on Saturday. Chaudhary joined the Congress at the home of party's Uttar Pradesh unit chief Raj Babbar in New Delhi. While this afternoon, Chaudhary refuted the rumours of joining Congress. Sapna Chaudhury Denies Joining Congress | BJP MLA Sapna Chaudhury has denied reports of her joining the Congress party. This afternoon, Chaudhury in a statement said, "I have not joined the Congress. The photograph with Priyanka Gandhi Vadra is old. I am not going to campaign for any political party." There were reports that the popular dancer from Haryana and former Big Boss participant had joined the Congress party on Saturday. "The only person who should comment right now to clear the air, all these things- the mist around- is Advani ji," Uma Bharti said, adding that it would not be proper for others, including her, to comment on the matter. She was responding to questions on the party's decision to not nominate him from Gandhinagar, a seat he had been winning since 1998. BJP president Amit Shah will contest from the seat in the coming general election. 'It is for Advani to Clear the 'Mist'' | BJP leader and Union minister Uma Bharti on Sunday said it is for L K Advani to clear the "mist", after the veteran leader was not named as a party candidate for the Lok Sabha elections, and asserted that his stature was not affected by contesting or not contesting any poll. Heaping praises on the 91-year-old leader, Bharti said it was Advani who played the central role in bringing the party to such a position that Narendra Modi is prime minister today and added that he never craved for any position in his long political career. JNU Backs Alumnus Kanhaiya | JNU students have begun their social media campaign for alumnus Kanhaiya Kumar for his Begusarai candidature. On WhatsApp, students are spreading a message to promote the Twitter trend #Kanhaiya4Begusarai at large. The messgae reads, "His voice needs to be heard. We want to hear him. We know Modi doesn't. It would be a shame therefore if Kanhaiya is not the voice in the Parliament from Begusarai. The minimum we can do is to tweet in his support. Please trend #Kanhaiya4Begusarai at 4:30 pm Today. Friends, let's storm the Twitter and extend our solidarity as Kanhaiya needs to contest against all odds. He shall fight, we shall win." PM Modi to Rally in Bengal on April 3 | Prime Minister Narendra Modi will address two rallies in West Bengal on April 3, anounced BJP Leader Mukul Roy at a press conference today. Elaborating on his Bengal rally, he said that the PM's first rally will be at 1 pm in Siliguri and the second one at 3pm in Brigade Parade Grounds in Kolkata. Defence minister Nirmala Sitharaman, who was conducting the event in Hyderabad, also hailed the surgical strikes. Hitting out at the Opposition, she said the previous government should have carried out similar offensive after the 26/11 Mumbai attack. 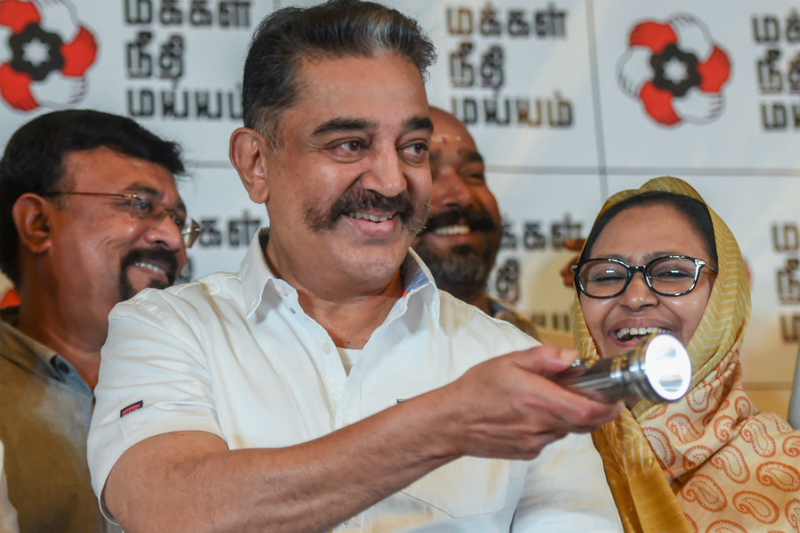 Actor turned politician Kamal Haasan's party Makkal Needhi Maiam (MNM) is set to release the names of remaining candidates and will also reveal their manifesto. Haasan will address a press conference at 6pm in Coimbatore and will likely put an end to the suspense over his nomination.